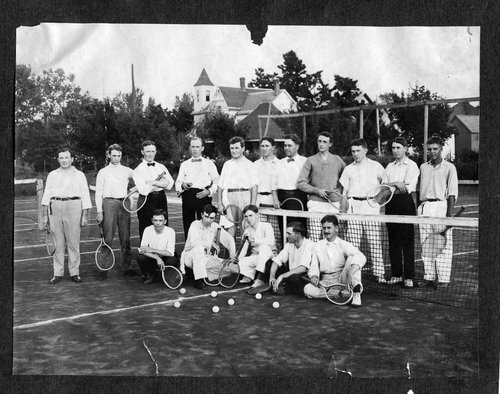 A photograph of the Topeka Lawn Tennis Club, published in the May 15, 1908 issue of "American Lawn Tennis". The members have been identified as: BACK ROW; FROM LEFT TO RIGHT: Charles W. Bower, Homer B. Fink, David W. Norton, James E. Larimer, James R. Wick, Walter E. Lux, Alvin D. Wick, Bart B. Bonebrake, William B. Collinson, Fred A. Wick, and Donald Mohler Neiswanger. FRONT ROW; FROM LEFT TO RIGHT: James William Dansey, Paul A Lovewell, Homer X. Shelden, Edgar B. Swain, and Fred A. Koester.